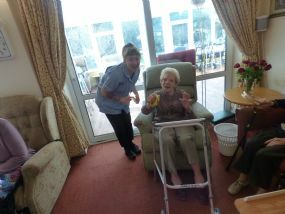 delivering care to the residents. Our Home Manager Tracy pictured with some of our dedicated staff of carers, activities and kitchen staff. Our Staff are ably led by the Registered Manager, Tracy Delannoy, who has been with us at St Dominics since 2010. Tracy has worked her way up from Carer to Team Leader and then went on to Clinical Lead ensuring our care staff’s skills and competences were to the highest standard. Tracy was then promoted to Assistant Manager and worked alongside our previous Home Manager, Jean Dolmor RN, for over a year. Following Jean’s retirement, Tracy took on the role of Registered Manager. Tracy holds all the necessary qualifications to manage the Home including the Institute of Leadership and Management Level 5 and is qualified as a Train the Trainer in all mandatory training courses. Tracy has an extremely caring and calm nature and is able to encourage our residents to fulfil their aspirations, and live in an environment that provides choice, dignity and respect. Tracy is also able to motivate staff to develop themselves to feel they are making a difference, that they are worthy, to have professional pride in whichever role they hold and to be respectful to all when carrying out their duties within the Home. Staff either hold NVQ qualifications or are working towards obtaining them, or the Care Certificate for their skills and competencies. Tracy continues the good rapport St Dominics' has with the local GP's Surgery, the District Nurses who come into the Home and she oversaw the change to a new dispensing Pharmacy. We are well supported by practitioners from outside the Home such as Farleigh Hospice, the Parkinson’s nurse, the COPD nurse, Speech and Language Team, Falls Unit and the Mental Health nurse. All our staff are fully trained in all aspects of care and Tracy, with the support of our staff, has enabled the Home to pass re-accreditation for ‘Gold Standard in Palliative Care’. Care is provided over a three-shift system enabling continuous 24-hour care. Charlotte Thomas is our Head of Care and splits her time of working shifts on the floor with care staff and working in the office with Tracy on admin days. Deborah Bennett is our Home Supervisor and splits her time of working shifts on the floor with care staff and completing audits on departments and clinical supervisions of staff. Marie Lloyd heads our night carers ensuring night care staff have a voice and liaises with day staff to ensure continuity of care for our residents. Each care shift is run by a Team Leader who is responsible for the smooth running of the shift. Each resident is assigned a Key Worker which is a member of the care staff who has responsibility for choosing and buying Birthday and Christmas gifts for their resident, making sure they liaise with the family with regards to clothing issues and toiletry shortages etc. 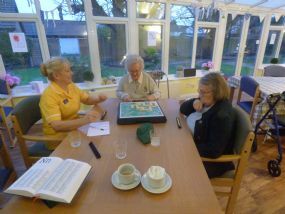 Our Activities team are supported by volunteers who attend the home on a regular basis, as well as our carers' involvement in the activities programme. 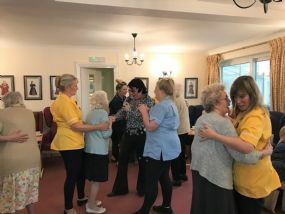 A full and varied programme is arranged for the residents within the home including a weekly Men’s Club and outings to nearby places of interest. For those residents who prefer to spend more time in their rooms or who are unable to participate in the activities held within the main lounge, conservatory or quiet lounge, due to ill-health, enjoy regular one to one's to ensure they too are included. 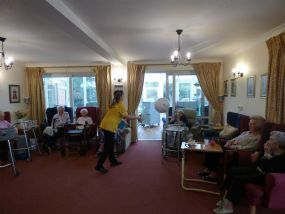 Regular activity sessions for our dementia clientele are often hosted by a carer and supported by the activities’ staff. Our housekeeping team work tirelessly to ensure that the Home is kept clean and fresh. There is a fully equipped laundry ensuring that residents’ clothing is efficiently laundered and returned. Our kitchen is manned by a small team of cooks who are all trained to cook good, wholesome food which accommodates all of our residents’ dietary needs. They provide a wide choice of dishes and the menu is resident led. Wine is served at lunchtime and you will often see the owner attending lunch service to ensure everyone's glass is topped up. All staff are trained in the same values and ethos of the home to ensure continuity of the excellent care provided. Many of our staff are multi-skilled and work across departments to support the smooth running of the Home. Morning exercises with Kiddley Divey. Ball games to wake us all up! 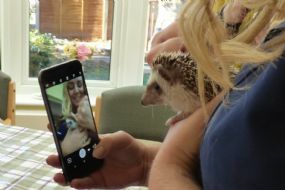 Charlotte our Head of Care couldn't resist taking a selfie with this gorgeous little fellow! A rather competetive game of scrabble. Gary Graceland was a huge hit when visited us for the first time.